Remember the last time I talked about time tracking? Well, my company has gone ahead and got it installed for all employees and now we have this application ticking away and tracking every move we make (almost!). Now employees should appreciate us helping them be more productive, shouldn’t they? Employees should be throwing their arms around us and thanking them for realizing that they really just spend half the time they though at their desks! Why then is there such a furore? It looks like we’ve only managed to push people away? Why? Because managers can now also see just what their direct reports are up to? And what’s worse? No employee ever really spends 8 working hours glued to his screen. When reports throw up hours like 4 & 5, they are in shock. Does this mean that they now need to spend 11 hours or more at work just to make sure they clock 8 on the application? Or do they start eating their lunch at their desks and cut out on social time altogether? 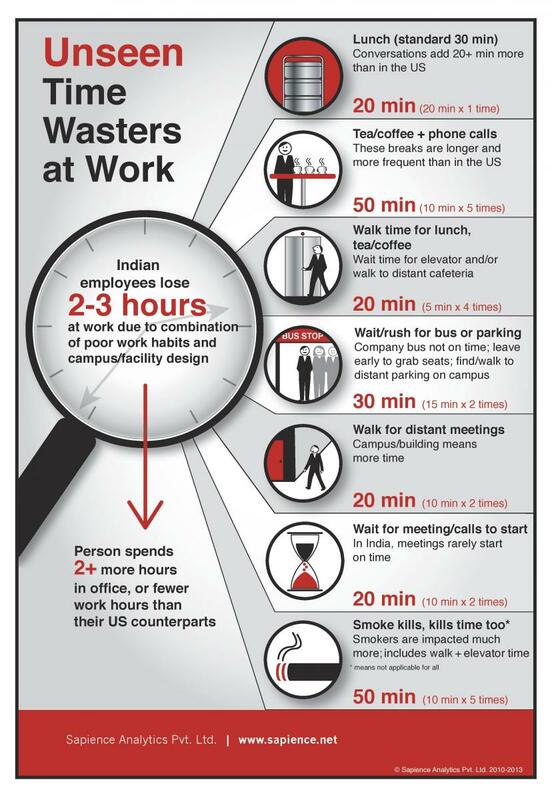 I recently came across this infographic which made me wonder if a 30 minute break for lunch is really harmful enough to be listed as ‘time wasters at work’. Tracking is good! I’ve said that before. But it’s equally important that the purpose with which an organization uses it is that of self-development and not that of micro management. What does my time tracker tell me right now? I rather not say!